ATLANTA — In a celebration with community leaders, Georgia-Pacific recently marked the completion of an approximately $40 million expansion at its Gurdon, Arkansas, lumber operations. The project expands the production capacity of the lumber mill by approximately 60 percent. Positioning the facility for long-term success, the expansion includes the installation of a new continuous dry kiln, a state-of-the-art planer mill, as well as related infrastructure improvements. The plans to begin the project were announced in October 2014. Three years after launching a request for an Expression of Interest — through funding received from Natural Resources Canada for Canadian design teams willing to undertake an innovative approach to designing and building high-rise wood demonstration projects— the Canadian Wood Council (CWC) was in attendance at the ‘topping out’ celebration of the University of British Columbia’s Brock Commons Phase 1 tall wood student residence. The UBC Brock Commons building is an engineering achievement that can be attributed first to simplicity; second to modularity; and third to the use of cross laminated timber (CLT). The result is a building design that is simple to replicate, cost-efficient due to shortened timelines and environmentally desirable. With some modifications it could be used for commercial, residential and other applications. Info bulletin celebrating National Forest Week 2016. VICTORIA – Sept. 18-25, 2016, is National Forest Week in Canada – a time to celebrate Canada’s forests and the benefits they provide to Canadians. The theme this year is True North, Strong and Green. There are many reasons why this year’s theme is particularly suited to British Columbia. B.C . is certainly green – it’s home to more forest than any other province in Canada, with 55 million hectares of forested land, most of which is owned by the citizens of B.C. Did you know that B.C. is the only jurisdiction in the world with an independent watchdog organization that provides oversight of forest companies and government agencies to ensure forest planning and practices are sound and that the public’s interests in B.C .’s forests are being served? B.C .’s Forest Practices Board has carried out this role for over 20 years,acting on behalf of the public owners of B.C . forests. Maple Ridge, BC – More than two years of work have led to the opening of DEMO International®, which begins tomorrow and runs through Saturday in Maple Ridge, BC. This three-day forestry event is one of North America’s largest and most distinctive outdoor equipment shows. DEMO International® is an “all live and in action, in-woods” equipment show, which features the latest technologies in equipment, products and services covering all aspects of woodlands operations. It is the flagship event of the Canadian Woodlands Forum and takes place every four years in a different location. This year, it is returning to the west coast for the first time in 16 years, and will be hosted by the Faculty of Forestry at the University of British Columbia. Comments are being accepted until Nov. 21, 2016, on a discussion paper released today as part of a comprehensive timber supply review for the Arrow Timber Supply Area. Public feedback on the discussion paper will be considered by the chief forester before setting the new allowable annual cut. The discussion paper provides the results of the timber supply analysis, including a base-case harvest forecast. It also describes the geography, natural resources and current forest management practices in the Arrow Timber Supply Area. The Arrow Timber Supply Area covers 816,115 hectares with 156,509 hectares available for timber harvesting. Communities in the timber supply area include Rossland, Trail, Castlegar, Slocan, New Denver and Nakusp. There’s a sugar maple in Gage Park that is worth more than $21,000. As lumber? No, as an annual estimate of what it adds to the city’s life, a collection environmental and aesthetic benefits that include energy conservation, air quality improvement, CO2 reduction, stormwater control, and property value increase. In recognition of National Tree Day Wednesday, the City of Hamilton labeled around 150 trees around town with a price tag to promote the idea of the value that may not be fully appreciated. Alex Moroz, the Community Liaison Coordinator with the Parks and Cemeteries department, said they use an online tool like this one to determine an individual tree’s monetary value. These calculators factor in things like species, condition, location, and size of any given tree. Hundreds of young students from the Humber Valley area got to learn all about the value of the forests around them during Explore Forestry Day Wednesday. The Grade 5 and 6 students spent the morning at Margret Bowater Park in Corner Brook, where a number of displays revolving around forest stewardship and innovation were set up. They were able to learn about forest insects, including how pests are managed; how forest fires can be prevented and fought when they do break out and about how the renewable resource is a vital part of the provincial economy. Elmer MacKay quoting Demosthenes (Sept. 7) is very appropriate for today’s forestry industry: “Stop doing what you are doing.” We need to do just that in the forestry sector. … What is needed is a public land-use policy that does not change with every government, with regulations, tax incentives and, for non-resident owners, tax penalties. These help woodland owners understand the value of managing their forests according to best practices, which keep a growing forest renewing itself and still profitable and integrated. Profit need not always be a motive. Forestscaping, with trails for example, enhances recreational use and esthetics, which increase value. The WA Government is leading Australia in promoting forestry and the expansion of softwood plantations, according to the industry’s peak lobby group. Australian Forest Products Association chief executive Ross Hampton said the industry was delighted with plans to arrest an alarming slide in the size of softwood plantations in WA. The Government will invest $21 million in expanding pine plantations in hubs around Dardanup and Neerabup. LOS ANGELES — A firefighter among those battling a central California wildfire died Wednesday and another was hurt when the water truck they were in overturned on a highway miles from the fire lines. The accident happened as firefighting crews gained ground in their effort to contain the 19-square-mile fire on Vandenberg Air Force Base. The truck crashed just before dawn at a roundabout on Highway 246 about two miles (3.2 kilometers) outside the city of Lompoc, Ventura County Fire Department spokesman Steve Swindle said. Venture County firefighter Ryan Osler was killed, and Adam Price was injured. There were no other occupants in the truck. Osler, 38, was a second-generation firefighter whose father worked for the same department. The Trudeau government may be able to achieve its Paris climate change commitments without imposing high, politically unworkable carbon prices, says energy economist Mark Jaccard. Jaccard is the lead author of a new report published by Simon Fraser University’s School of Resource and Environmental Management, where Jaccard is a professor. It was published just days after federal Environment Minister Catherine McKenna announced her government will impose a national carbon pricing scheme, with or without the cooperation of provinces like Saskatchewan, where Premier Brad Wall has emerged as Canada’s most vocal carbon tax critic. …This year, B.C.’s sockeye salmon run was the lowest in recorded history. Commercial and First Nations fisheries on the world’s biggest sockeye run on B.C.’s longest river, the Fraser, closed. Fewer than 900,000 sockeye out of a projected 2.2 million returned to the Fraser to spawn. Areas once teeming with salmon are all but empty. …So what’s going wrong? Climate change is amplifying a long list of stressors salmon already face. Sockeye salmon are sensitive to temperature changes, so higher ocean and river temperatures can have serious impacts. Even small degrees of warming can kill them. Low river flows from unusually small snowpacks linked to climate change make a tough journey even harder. …The question is, can [salmon] — and the ecosystems that depend on them — survive climate change and fish farms and all the other stressors humans are putting on them? 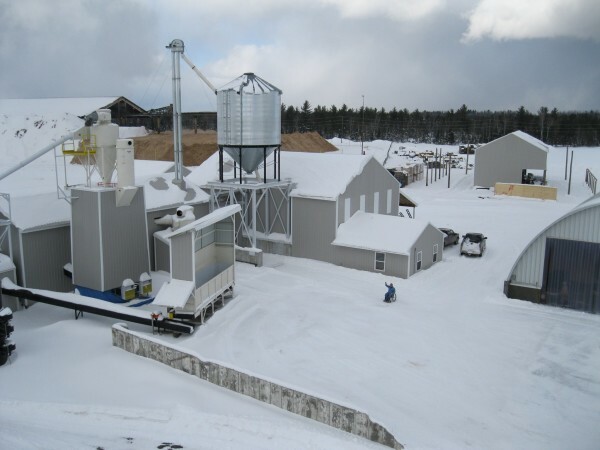 Ashland-based Northeast Pellets has won a new contract with the University of Maine Fort Kent that’s set to boost employment and sales at the company following a challenging heating season. Northeast Pellets and UMFK have signed a one-year contract for the firm to supply the university with biomass heating pellets, with the potential for two annual extensions, according to a media release from Northeast Pellets. Matt Bell, founder and president of Northeast, said the deal is expected to require more workers and to grow the mill’s revenue by around $750,000 over three years if the contract is twice-renewed.